If you’re thinking about upgrading your bathroom, it’s wise to be aware of these common design trends that many homeowners are opting for. For your bathroom design the size of the room really matters. Many homeowners are increasing the footprint of their bathrooms by either taking-in in whole part closet area, expanding into a linen closet or even an area of the bedroom to enlarge their bathroom. Thus creating a space having a roomy and relaxing atmosphere. However in some instances this can be accomplished by redesigning the fixtures in the existing bathroom. In expanding the space, you can have a free standing tub in one area for relaxation and a separate shower area that the children may also use. For resale value it is known that at least one tub should be present in the home. 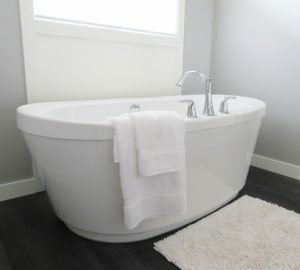 Thus, in a smaller bathroom a free standing tub can be pushed against the wall offering more room for the shower. 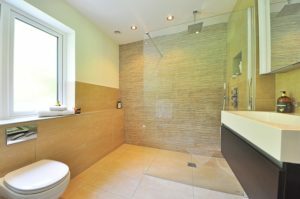 Many homeowners are removing tubs and in some instances expanding the space in order to have a large luxurious shower area. Handheld shower units near benches, body sprays, and steam units are options to make a relaxing shower experience. Safety should be taken into consideration and grab bars that can match towel bars can be installed. Curbless showers for ease of entrance is another consideration. In tiling your bathroom using larger tiles gives a clean and serene look and less grout is required thus giving a spa like atmosphere. Different patterns can be used in various areas, particularly in the shower area. Here unique patterns such as porcelain and glass tiles can be designed to give a rainfall effect. Install recessed shelves in the tile to store your bathing supplies. What kind of bathroom do you truly want? The move is toward smart tech such as digital shower controls and heated floors, sustainable products including self cleaning and water saving toilets, adding bold accent colors and moving toward barrier free and curbless showers. Some people expand and remodel their bathrooms for their enjoyment and others to sell their home. Either way, give your bathroom a unique look. This entry was posted on Monday, November 19th, 2018 at 10:59 am. Both comments and pings are currently closed.